I have gotten so many comments and testimonies from my “Mascara Saver” post that I decided to do another beauty secret. In the summertime, whether we like it or not, we have to have freshly shaved legs at all times between shorts, capris, and the inevitable swimsuit. One thing that helps me bare my legs with confidence is making sure they’re tan using my favorite trusty self tanner (which I shall feature on the blog very soon). But self tanner can be tricky if your legs aren’t exfoliated properly, it will cling to every spot of dry skin or unshaven bit. In fact, shaving itself is better with exfoliated skin. When you shave without exfoliating, you’re simply shaving off a layer of dead skin rather than getting actual hair (this also causes ingrowns.) But if you exfoliate first and then shave, you get straight to the matter at hand, the hair, and the result is a super silky smooth “like a baby’s behind” leg. But this easy DIY scrub takes to it a completely new level and is made with ingredients you have around the house. Simply take 1 cup of sugar, 1/2 cup coconut oil, and the juice of one lemon and mix them together in a bowl. 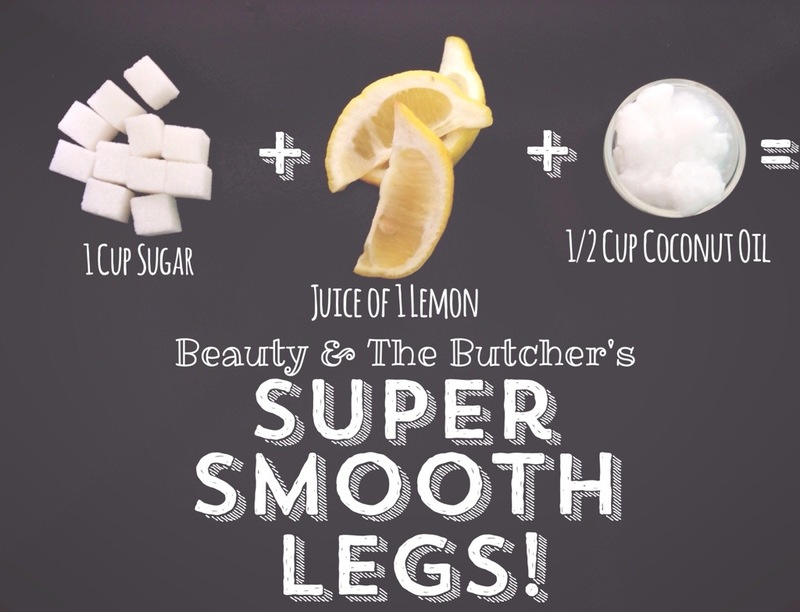 Scrub onto to your legs, shave, and rinse. Repeat once more and your legs will be so slippery smooth you won’t even be able to cross them! Hey Lori! Can’t wait try this new concoction! THANKS for the tip! Hi! Please let me know how you like it! I’m totally going to try this! Thank you for the tip. And I never thought about exfoliating before shaving. Do you recommend using a loofah and shower gel/body wash? Hi Emily, stay tuned for tomorrow’s post (written just for you) to get your answer! Ooooo! I’m excited and feel so special!